For men today socks in mercerised cotton, wool or thermal cotton are no longer background details but real protagonists of every outfit with attention to detail and personalized. Men's knee-high socks, colourful or in solid colours, therefore, acquire more importance and become accessories that can radically change an outfit. Therefore, we at Calzitaly have dedicated a section of our online store to every man, just like you, who is in love with style and attentive to every detail of clothing. Here we have gathered our best knee-high socks for men, available in various styles - from the most classic and traditional to the most extravagant - to satisfy all tastes. 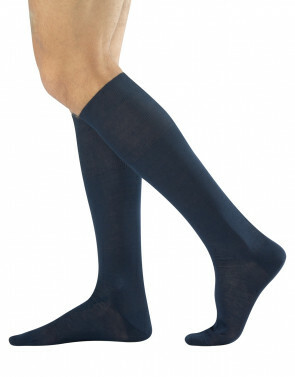 The men's knee-high socks available are perfect to give a fresh and youthful touch even to more formal clothes. 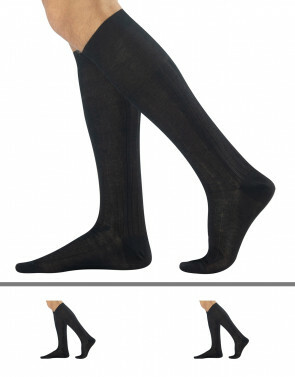 Men's Knee-High Socks: Take a Look at the Models Available. Our classic line includes men's knee-high socks in the most classic styles and colours such as black, brown, blue and grey. The assortment includes both men's socks in mercerised cotton, a precious cotton, which is lighter and finer, but also men's socks in thermal cotton; both models are available in both ribbed and plain pattern to match every taste and trend. Finally, the line includes men's wool socks and other models of men's winter socks perfect in the colder seasons. Men's knee-high socks are certainly the male accessory on which to focus to be impeccable on every occasion, from work to leisure as well as special events: an indispensable detail of style and originality, even for the most elegant men. Free Your Imagination With Calzitaly's Colourful Men's Socks. You will not only find men's knee-high socks in solid colours in our online store, coloured men's socks are also available, youthful and cheerful, perfect to keep up with the times! These products are dedicated to the modern man who wants to wear a garment that can make even a simple elegant suit special: that is why we wanted to revolutionize the idea of men's knee-high socks, offering various solutions suitable for any age and available in many different colours, motifs and patterns. In this section, you can find socks decorated with polka dots, large diamonds, but also more classic models decorated with small coloured diamonds, or other more youthful like those with stripes and horizontal bands. All men's solid coloured patterned socks are made with fine materials and have a practical band below the knee that keeps the sock in the desired position, preventing it from falling down while walking.